Enter an address for directions. Plus we make our own Quality Vacuum! all floors, carpet, rugs, pet hair, sand, stairs, furniture and allergies. 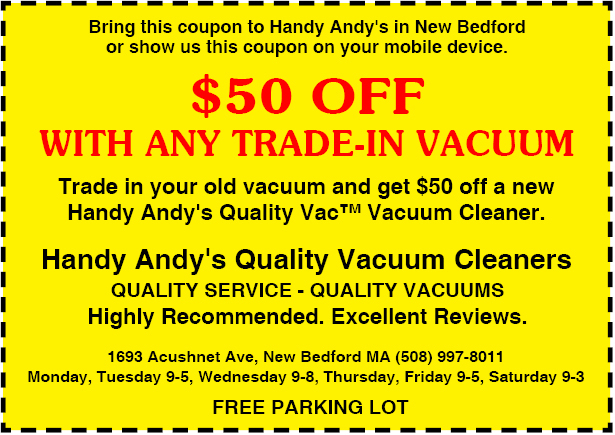 Trade in your old vacuum at Handy Andy's in New Bedford and get a new Handy Andy's Quality Vac™ Highly Recommended. Excellent Reviews. "We make the best new vacuum you'll ever own!" Top rated, best all purpose vacuum for all floors, carpet, rugs, pet hair, sand, stairs, furniture and allergies. Best whole house vacuum. Easy to use, easy to push, strong powerful suction, effective reliable performance and durable quality construction, made with many metal parts. 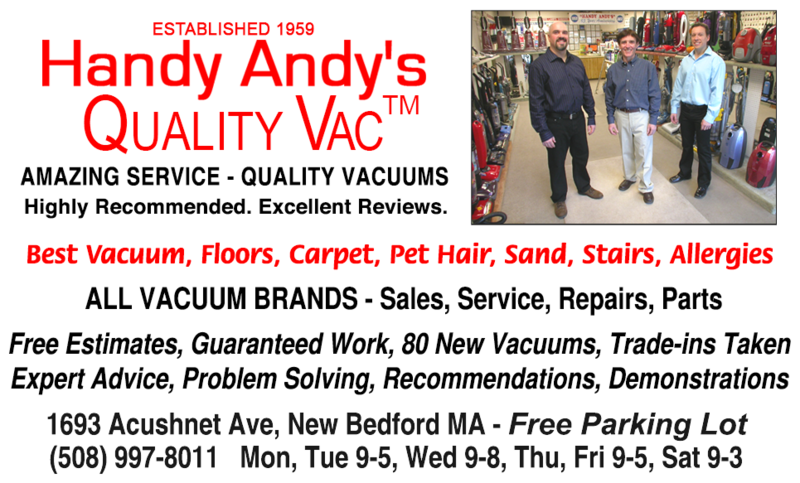 Handy Andy's Quality Vac™ is built to last! Best multi-purpose, multi-floor and multi-surface vacuum with all attachments. Brushroll on/off selector for all floors, carpet and rugs. Automatically adjusts from one surface to another, from floors to carpet and rugs, or from carpet and rugs to floors. Best vacuum for hardwood floors, wood floors, laminate floors, tile floors and bare floors of any kind. Best vacuum for carpet and area rugs. Automatically adjusts for carpet and rug height. Deep cleans carpet and rugs. Removes embedded dirt, sand and hair. Best vacuum for pet hair, dog hair, cat hair and long hair on floors, carpet and rugs. Specially designed vented nozzle with deep cleaning brush, combines powerful suction and airflow to vacuum up pet hair off any surface. Best pet hair tool. Powerful, professional quality, handheld turbo brush. Vacuum pet hair off furniture upholstery, carpeted stairs, bedding, mattresses, car interiors and more. Best wood and bare floor brush attachment for all floors, hardwood, laminate, tile and bare floors of any kind. Gently vacuum wood floors with long soft natural bristles. Lightweight extra long vacuum cleaner hose and long reach extension wands. Onboard quick pick-up vacuum hose and tools. Reach all around the room without dragging the vacuum. Best vacuum for stairs and ceilings. Reach all the way up stairs without lifting the vacuum. Vacuum cathedral ceilings and ceiling fans without a ladder. Precision size and shape vacuum accessories, long natural bristle dusting brush, upholstery tool, crevice tool, plus a long reach flexible crevice tool for cleaning under refrigerators, reaching inside clothes dryers and more. Best vacuum cleaner attachments. Best vacuum for furniture, upholstery, woodwork and baseboards. Vacuum under couches and beds with a low profile floor and carpet nozzle. Best vacuum for allergies. Hygienic anti-allergy clean air system collects dust and allergens featuring both HEPA and electrostatic dust and allergen filtration. Extra long power cord. Vacuum from one room to another without unplugging the power cord. Take this powerful, durable, all purpose vacuum outside and vacuum your car, porch, deck, garage or shed. Best overall vacuum. Handy Andy's Amazing Service and Guarantee. Five Year Guarantee, all parts and labor, including free yearly tune-ups for five years, plus one free lifetime overhaul good anytime out of guarantee. You'll love it! Over 9,000 sold! We have easy no interest payment plans only $59 monthly. All Images, Format, Content and Design are Copyright © 2019 MC & Handy Andy's Quality Vacuums, Inc.